Given the success of Owen & Mzee, it was only a matter of time before the rest of the zoological world rushed to cash in, as evidenced by these adorable playmates from the Taman Safari Zoo in Indonesia. I can just hear the zoologists thinking: "If the world can fall in love with a fat hippo and an ugly tortoise, imagine what they would do for something that's actually cute... like baby orangutans and baby tigers! Wait, why stop there?! 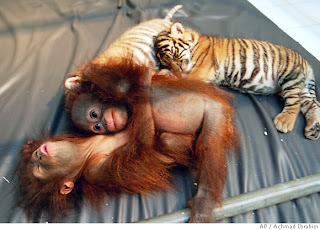 How about TWO baby orangutans and TWO baby tigers?! Cha-ching!" Expect more interesting zoological nursery combinations to emerge in the next few months: Baby penguins riding on top of baby elephants, baby rattlesnakes playing four-square with infant dung beetles... the possibilities are endless. Reality Check: Mixing baby orangutans and tiger cubs is obviously very cute and sounds harmless enough, but anyone who has seen The Jungle Book knows that this will not end well.